The purpose of Ali Lassen’s Leads Club is to assist you to get good business referrals that will expand your business success. 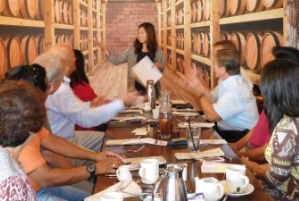 Leads Club is dedicated to maximize the use of your time and resources to get good business referrals. To accomplish this goal, Leads Club uses a method of spaced, timed, repetition of information. Leads Club is not in competition with other groups or clubs, nor are we a social club. We are an advertising service dedicated to increasing members’ business success. We meet once a week, for lunch on Tuesdays, for one hour and 15 minutes. We meet approximately 50 weeks a year, generally taking off the weeks of Christmas and New Year’s. At every meeting, each member gives two 30 second “promotionals” — one at the beginning and one at the end of each meeting. Members are also scheduled to give an in-depth 10 — 15 minute presentation at least five times per year (the total number depends on the current size of our chapter). To get a sense of how a meeting runs, please play our “Welcome Video”. Fellow members become intimately familiar with your business and can confidently recommend you to their friends and colleagues. The existing relationship between a member and their referral can provide valuable feedback on why you did or did not make the sale. This feedback will help you hone your sales technique. Networking with fellow members will help you identify new avenues and ideas for business promotion or marketing. You may discover ways to jointly market your business with one or more members. Members share information on the products and services which make their businesses more productive and profitable. New businesses can profit from the advice and counsel of more experienced members. As your knowledge of other products and resources expands, you can use this referral base to become an invaluable referral source for your customers. This increases your value to them and reduces the appeal of lower priced competitors.